You can make a 5-Star gourmet dish with this recipe! It’s “gourmet” because it tastes so good and is so healthy. And it SO EASY to cook! Perfect as a complete lunch meal or as dinner with a fried egg and grilled chicken. Want extra nutritious? Extra delicious? Enjoy this dish with chicken or a fried egg. If the quinoa is still too moist, put the lid back on for another 5 minutes. 1) Wash and rinse RESTORE™ Bolivian Quinoa and put into a pan/wok on the stove. 2) Add the Water/Chicken Broth/Vegetable Broth. 3) Then, add in the chopped pineapple, sweet corn, green peas and Italian herbs. 4) Season with salt and black pepper. 5) Stir the ingredients to make sure they’re well-mixed. 6) Bring the ingredients to a boil. 7) Once the broth is boiling, cover pan and reduce heat to “LOW.” Cook for 15 minutes. 8) After 15 minutes turn the heat OFF. 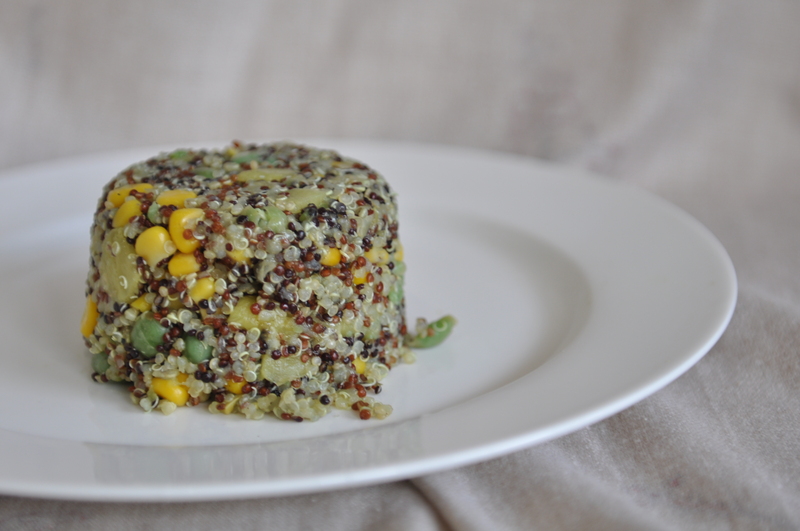 Uncover and fluff the quinoa with a fork. 9) If still too moist, cover again for 5 minutes and leave on stove WITH THE HEAT OFF. 10) Grab a plate! Your gourmet meal is ready to be eaten!